After we talked to Angela Hardman (Head of Public Health Tameside) and Councillor Jim Fitzpatrick at the beginning of the year, we have followed that up with a meeting with the project team. We were hoping to get the councillors to make a pledge but apparently activity is suspended because of the general election so that will have to wait! We may be able to join in with some of the Public Health department initiatives perhaps their "Every contact counts scheme" which is designed to support citizens in many ways. One of the local Brownie packs was supporting the girls through their "Healthy Heart" badge. We were able to go along & talk about how important it is to keep healthy and look after your heart. There was a great discussion and then all the brownies made Health Pledges. Fox, Mummy Fox, Squirrel and Swan joined in too! The Health Pledge Team are back at the Clarendon Centre in Hyde on Saturday the 31st of January. They will be there to talk to shoppers about Health Pledge, show them the Health Pledges we have already received (187 so far) and hopefully inspire them to take small steps to improve their health. We will be there from 9:30 to 16:00 and would love to see you there so why not come along? The benefits of activity are well known but many people struggle to be active at all and see the official advice of two and a half hours of activity a week as impossible to achieve. Unfortunately that official recommendation puts them off trying to be even a little bit more active in their daily lives. As seen in our previous blog article increasing activity for the inactive by even a small amount can bring a marked improvement in their health. At Health Pledge our whole idea is based on taking small steps to improve health. Over the long term we are convinced that those small steps towards a healthier you will add up to big changes in your health. A large study of over 300,000 people in Europe has highlighted that even a small increase in activity levels for the inactive can have a massive benefit long term. Adding a brisk walk of 20 minutes each day is enough to make a significant difference in an inactive person's health. 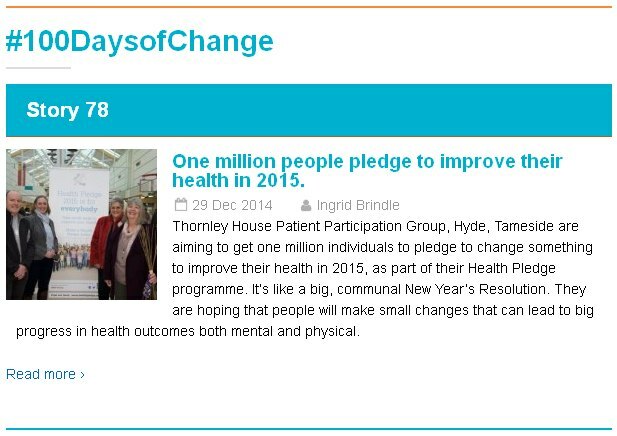 The Team are delighted that Health Pledge has been selected as an inspirational story for NHS Change Day's 100 Days of Change campaign. We hope that this will spread our message far and wide, inspiring more people to take small steps to improve their health. You can read their article here. NHS Change Day is a fantastic campaign inspiring people within the NHS to pledge to do something to make a difference. Easier pledging on the website! We have updated the website so you can make your Health Pledge without having to register on the site first. Theis makes it very easy to make your pledge. All you have to do is click on the image and enter your pledge. We hope to see your pledges soon! Read more about Easier pledging on the website! Here are the videos recorded at the launch on Health Pledge in Hyde yesterday. Many thanks to all who came and helped, supported and the people of Hyde who took an interest. Let's hope it is the start of a journey to healthier lives for all of us. Ingrid giving the background story to Health Pledge and explaining the idea at the Health Pledge Launch in Hyde earlier today. We had a great response from the public today in Hyde. Thank you to all who came and saw us and a special thank you to everybody who helped make it happen or supported us. Here's a video the fantastic Tameside Voices Choir who drew the crowds in!